The latest offering from Bram Stoker Award winner L.L. Soares (Life Rage) is Buried in Blue Clay (2017, Post Mortem Press). We’re immediately on board (both literally and figuratively) with Reddy Soames, a writer who’s not sure he’s still got what it takes, and drinks too much while he ponders this question. He’s heading back to his hometown of Blue Clay to investigate the urban legends of his youth in the hopes of getting a book written based on them. Growing up, he’d heard rumors of jellyfish-like aliens with ties to the azure-sanded beaches of Blue Clay. Reddy makes contact with another writer in town—Bellows has published his own musings on the rumors of strange beings associated with Blue Clay—and though the two men take an instant dislike to each other, they’re often forced to bear each other’s company while investigating the mysteries of the town. Eventually, Bellows hooks Reddy up with HEK—a charismatic teacher with a bit of a cult following. Reddy’s quickly drawn into a world of unearthly creatures, big, blue secrets, and a weird, ritual-abiding group determined to recruit and redeem Mr. Soames. Reddy’s a mostly likeable and frankly honest sort, a man careening toward middle age who has long since stopped worrying about fame and fortune, focusing more on getting by with the help of liquor and the occasional lady friend—sometimes gentlemen friends, too. HEK, on the other hand, is a man of secrets, and while you may get frustrated at his refusal to give up answers, don’t worry—Reddy shares your frustration. The novel maintains a strong, suspenseful pace of bizarre mystery, keeping you turning the page. Nobody is safe in the world Soares has written here, which makes for several surprising twists and turns. He paints a town whose beaches of sapphire clay sound, quite frankly, beautiful, in stark contrast with the weathered, depressed landscape of the struggling working class. Reddy’s navigating middle age and the unremarkability of his own life: a few jellies and giant centipedes might be just the thing to spice it up. Faced again and again with the choice of doing something extraordinary though clearly dangerous, or fading into obscurity, Reddy’s actions make him all the more relatable. You may not get all the answers you seek, but you’ll finish the book knowing one thing for certain: you are not alone. It’ll also leave you wondering: maybe we are not alone. 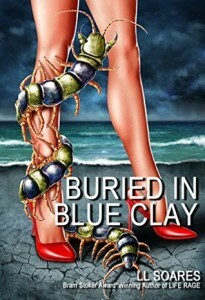 Buried in Blue Clay is available on Amazon and Barnes & Noble. L.L. Soares can be found at www.llsoares.com or reviewing movies at Cinema Knife Fight.